It seemed simple enough and actually quite an interesting project: fit some management to a Mazda 13B Rotary Wankle engine. To make it even more interesting the engine was in a Caterham 7. The existing set-up was a single 48mm Dellorto carb with one choke feeding each rotor. I never drive a car on the road prior to conversion but we did run it up on the rolling road for a full throttle power run. This established our base line power at 188 bhp @ 7000 rpm. The conversion did not go well right from the off. There were all sorts of wiring problems under the dash which we found while trying to locate a feed for the ECU. We made up a fuel pump and swirl pot to mount at the back of the car using the original carb fuel pump to feed the swirl pot. At the back we actually found THREE fuel pumps. It would appear they failed in succession and rather than do the job properly someone had just put a new pump alongside the old, repeating the process when the second pump failed. We put a proper filter in the line to protect the injection pump. The next job was to remove the front pulley and fit a trigger wheel. Easy enough: or so I thought. Taking the pulley off was a piece of cake and I soon had the wheel mounted and a plan for the bracket to hold the pick-up sensor. It was then just a case of popping the pulley back on...oh, it won’t go back. A call to a mate who rebuilds/tunes these engines soon had me looking for the worry beads. The crank has a pair of rotary roller thrust bearings and if you take the pulley off they fall down and you can’t align them without taking the engine to bits, or taking the engine out and standing it on end! Being under time pressure I was not keen to take the engine out and opted to drop the sump and take off the water pump, oil pump, alternator and front cover. Then I could get to the thrust washers and the balance shaft that is keyed to the crank (this had also fallen down). After it was all back together I made up the pick-up sensor bracket and slotted the mounting holes so I could swing it in and out to adjust the gap. Normally I would find a rough TDC by putting something down the plug hole but this was never going to work with an engine minus the pistons and a conventional bore. I resorted to using what I was told were the TDC marks on the front pulley which turned out to be about right to set the trigger wheel reference gap position. That just left the oil pump that feeds engine oil up into the inlet manifold. This was connected to the carb throttle arm but I could not replicate that because we had a throttle pot in that position, on the 48m throttle body. 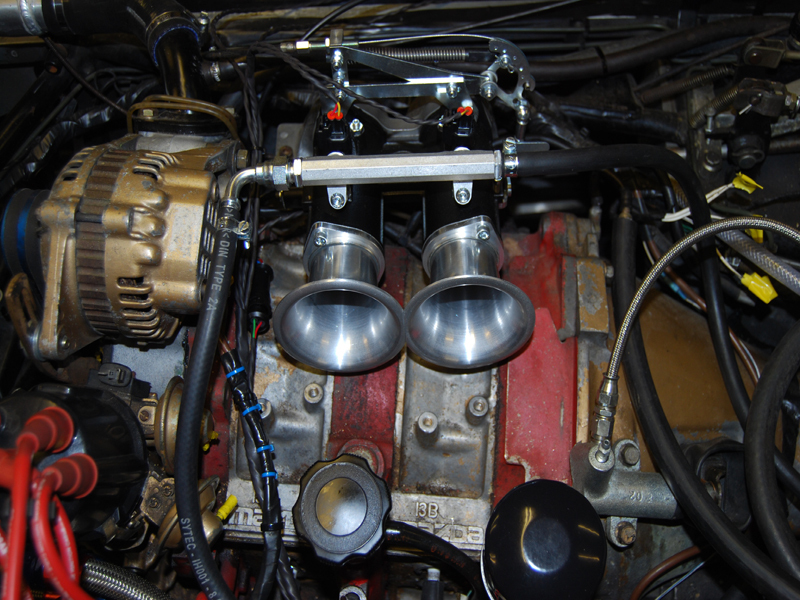 We used a 48mm body because the carb was 48mm and it would match the manifold. 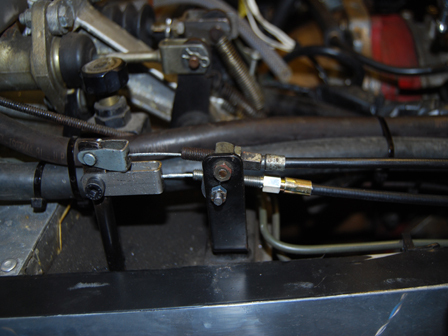 I ended up making a second throttle cable system driven at a link ratio that duplicated the original pump movement. Time consuming but it works quite well. With everything wired and plumbed she fired up pretty much straight away. I mapped it and tried different timing on the leading and trailing spark plugs and we finished up with a whopping 209 bhp at 7250 rpm. So job done then; mission accomplished – no way. I drove the car on the road and it was dreadful. With conventional mapping the engine would flat spot after being on the overrun and gulp air if you rapidly opened the throttle from a cruise condition. Snap throttle opening was okay. It would appear that the ugly curved inlet manifold centrifuges the fuel onto the outside wall and if it dries out you get a flat spot. The answer was to run it much richer and then suffer the fuel consumption consequences. I ended up with three maps, one conventional map and two progressively richer. The car is fast, no doubt and the quirky exhaust note attracts a lot of attention but I think it may need another set of injectors much closer to the inlet ports. At the moment that’s just speculation and I am awaiting a road test by the car’s owner to see how the conversion stacks up against the 48mm Dellorto carb. The Maserati engined Standard Nine almost got mapped with a fuel pump that delivered more than the original 150 bhp injection pump. We saw well over 350 bhp on part throttle but then we had a bit of a drastic failure with a fuel line. The hose burst spraying fuel all over the interior of the car. That one has gone off for re-plumbing with decent quality hoses and will come back once it is sorted. There was also an issue with the engine breather system pressurising the dry sump tank. 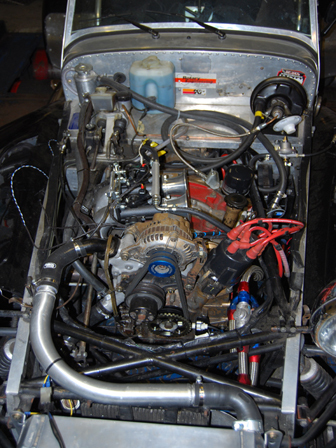 After the close call with the Maserati engine we had more drama with a VR6 engine in the back of a fibre glass car. I won’t go into details but the exhaust caught fire. The CO extinguisher put it out but it re-ignited as soon as the extinguisher was empty. The Powder one got it but what a mess! That convinced me to invest in a set of extinguishers, CO, foam and powder, plus read up on how to use which one for what type of fire. They are now positioned about the building. We have never really had a problem in nearly 20 years of running the rolling road but seeing the thing re-ignite put a scare into us. I could see the building going up as well as the car! You really can have too much of a good thing. We had an engine on the Superflow Dyno a while back which kept detonating. When we stripped it the compression ratio was 15.8 to 1! Last week we had another problem K which would not take any advance without detonating. Not simple Pinking but really banging off. A quick check with the compression gauge showed another mega compression ratio. Not on the stop of the gauge like the previous engine but real close. Come on guys, if you build an engine you are supposed to measure the compression ratio with a burette, not put the thing together and just expect it to be all right.